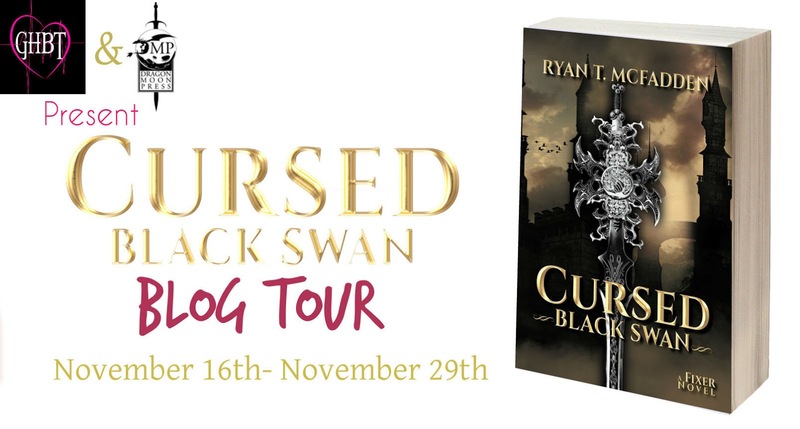 Welcome to the Cursed: Black Swan Blog Tour. Read on for my review and don’t forget to enter the Giveaway! His latest job was supposed to be simple—recover the sword Black Swan. Except there’s no such thing as a simple job. When the operation goes bad, the Crucifiers, the Crooked Hand, assassins, and Crusaders are all hot on Nathaniel’s trail…for a sword he doesn’t even have. All he has to do to get it back and set his world right is to find the woman of his dreams…and kill her. This book was a helluva lotta fun. It was over the top and bloody with just the right amount of humour, just the way I hoped it would be. The main character Nathaniel is a fixer, he makes problems go away, often violently. Somehow, his plans often go awry and he ends up imprisoned, beaten up and more than likely having to kill a lot of people to get out of whatever mess he had created. He is at odds with most, if not all, of the crime syndicates , so when a job goes south and he is given a chance to get good with one of them, he has no choice but to accept what seems like an easy steal! But it’s not as simple as it seems because the sword he is meant to steal is coveted by, well, everyone who is anyone in the crime business. His failed attempt to steal the sword sets off a chain of events that will have his head spinning trying to keep up with all who are out to kill him, and this for a sword that he doesn’t even have. As if that’s not bad enough, he has to struggle with keeping ‘the dark’ caged , whose thirst for blood and death is unquenchable. Nathaniel is a bad guy and he does not care about pretending to be otherwise. I like his dry humour and his all round badassry. The author takes the time to detail his transformation and that really helps to shed light on ‘the dark’ as well as Nathaniel’s personality. I am not so satisfied with the explanation of how ‘the dark’ came to be part of Nathaniel though and that’s my only qualm with this story. Cursed: Black Swan is fast paced and action packed with enough blood and gore to satisfy any lover of dark fantasy. Fraught with mystery danger, and schemes aplenty, it is a satisfying , dark, often humourous read and not for the faint-hearted! I highly recommend it. If you like your fantasy dark and action-packed with an anti-hero who is ruthless, you will love this!! Ryan T. McFadden is a writer of fantasy and horror, with short stories and novellas published through Dragon Moon Press, Edge SF & F, and Absolute X-Press. In 2014, his novella Ghost in the Machine won the Aurora Award (Canada’s most prestigious award for SF&F) for Short Fiction. His motley past involved such dangerous work as database administration, ice cream flavouring (seriously, that’s a thing), hockey league administration, screen printing, web design, furniture building, and home renovations. Thanks for the great review! I certainly appreciate all reviews — even the ones that aren’t as friendly as yours. You are welcome and I honestly enjoyed it!